By the middle of September, Scilly residents had already been treated to singles of Solitary and Spotted Sandpipers, a couple of Baird's Sandpipers and some Buff-breasted Sandpipers over the course of the previous few weeks, underlining again what a productive year-round location this is. I arrived back a week earlier than the previous year due to the forecast for some tasty Atlantic weather expected around 21 September, my arbitrary date for preparing myself for the intensity of the coming six or seven weeks. Based on some solid predictions the previous year, I was already anticipating that there ought to be at least a Red-eyed Vireo somewhere in the South-West and, though it would have been nice if it had arrived in my location, one duly appeared at Nanjizal Valley, Cornwall. As it was, that proved the only major discovery on the current system and what appeared to be a decent forecast for some first-class Cornish seawatching fizzled out as the storm was rapidly downgraded on encountering the Western Approaches. This, alas, was to set the tone for much of the following three weeks. A very underwhelming forecast was soon in place for most of the country, the Northern Isles in particular. Elsewhere, birders in the rest of Britain – including the South-West – weren't exactly brimming with anticipation. Unless you were on Foula – which somehow attracted two American sparrows – it was mostly unrewarding, tough work. A day of hazy sunshine and light south-easterly winds brought a beautiful Tawny Pipit to the airfield on St Mary's; hardly a headline bird 20-odd years ago, but now reinstated as a genuine national rarity. I embraced the individual Will Wagstaff found on the airfield with some relish. I lingered on St Mary's until the end of the month, so I missed an astonishing spectacle of 2,500 Great Shearwaters passing St Agnes during strong onshore winds and poor visibility. I did see a few rafts feeding distantly off Giant's Castle on the same morning, but the geography of the islands dictates we don't always see a defined route these birds take. A superbly confiding Ortolan Bunting on Peninis allowed me to take a full-frame photo of it with the small pocket camera I carry for insects and snapshots, although an equally tame Grey Phalarope at Lower Moors was whizzing around too quickly in fading light for the slow-moving reactions of my non-specialist digital meter. The extremely confiding Ortolan Bunting at Peninnis Head, St Mary's (Paul Ash). Moving back to St Agnes and into Rosevear Cottage with Laurence Pitcher, Jamie Partridge and Lee Amery on the last day of September, I was greeted by news of two Beautiful Marbled moths having been caught at Troytown overnight. In past years, I've switched off to insect news by early October. This year the momentum gained from some exciting moments in the summer was a defining theme, during what was essentially a quiet first two weeks of the month for birding. The moths certainly helped usher me out of bed before the light was up on many days when the promise of birds was low. Many birders, particularly those who've placed all their eggs in the October basket, enjoy going out all day every day, whatever the weather. For me it's not easy covering the same routes time and time again without any encouragement. Sometimes I need someone to find a scarce bird just to shake me out of my lassitude. After lounging around the cottage for three full days of strong northerly winds, I sprang out of bed on a day of light southerlies and 50/50 cloud cover and went out with some purpose for the first time in a week. I hadn't been out of the house for 15 minutes when I spotted a Glossy Ibis flying over the St Agnes cricket pitch – soon afterwards picking up text messages announcing both Wryneck and Red-backed Shrike had appeared overnight. It's sometimes dangerous to assume only certain conditions are conducive to bird arrivals on a tiny island, but it's important to note how accurate it is much of the time. As my friend and Rosevear housemate Laurence Pitcher said to me, it is as important to note the failed predictions as it is to trumpet the successes. Sometimes, in the absence of any obvious rarity-hunting opportunities on Scilly, one takes the slightest encouragement from the most tenuous of conditions. A light to moderate south-westerly with a modicum of cloud cover has produced the odd bird in the past, usually a bunting, and is sometimes preferred to the more traditional south-easterly wind flow, especially if the latter is coupled by unconducive clear skies off a high pressure. It was in just such conditions on 8 October that Laurence found a Greenish Warbler mid-morning in the Island Fields and then, within the hour, he picked up a calling Red-throated Pipit flying into Periglis Beach. I missed the short-staying pipit, since I took it as a cue to look around the patch a little harder, but the Greenish went on to stay for a week and provided my first long look at the species in more than 20 years. 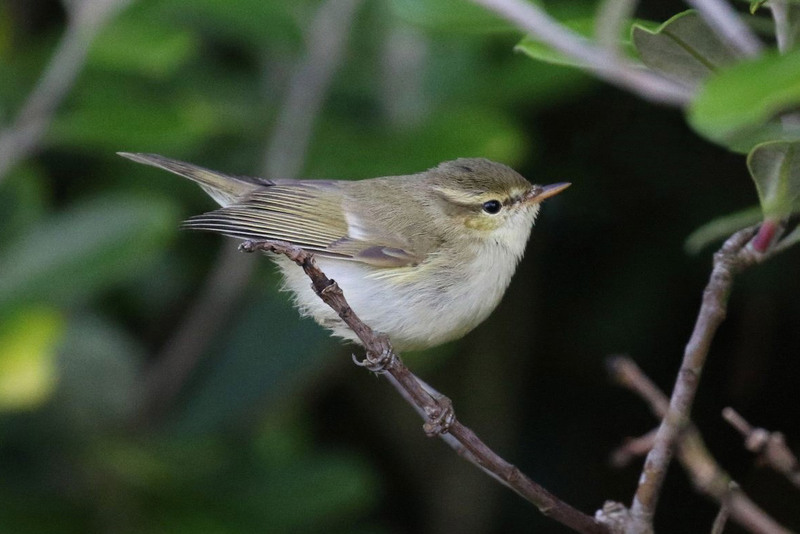 Laurence Pitcher enjoyed a fine day on St Agnes, finding this Greenish Warbler as well as a Red-throated Pipit (Laurence Pitcher). The most galling misadventure of the autumn, in terms of hopes raised and then dashed, was the storm system Michael that originated in the Gulf of Mexico and crossed the Carolinas out into the Atlantic. At first the charts had this remarkable low pressure tracking across the mid-Atlantic and arriving up the western edges of the English Channel, in much the same vein as systems that brought Rose-breasted Grosbeak and Cedar Waxwing to St Agnes in 2017. The fact this storm was crossing land raised the red flag even higher for expectant birders on the western edge of Europe. Crushingly, however, the storm hit the Azores High and petered off south towards Iberia, losing its identity. There were various discussions online as to the origin of the Grey Catbird that turned up in Cornwall later that day but, for me, it seemed most likely that it was this system that spat it out and hinted at the possibilities that could have come with a direct hit. What stopped me going for the catbird? Perhaps several reasons, relating to the fact I'm essentially a patch birder and that I'd lived among hundreds of them in the States. There were still a couple of mildly tempting weak frontal systems drifting across from more northerly parts of the American continent, and the whole ensemble of the catbird, a fly-over Bobolink seen by Kris 'Spider' Webb on St Mary's, and the desire to eek something out of St Agnes kept me rooted to the island. There was now a bit more genuine expectancy in the air on St Agnes than there'd been for much of the past fortnight. I began to grip my binoculars just that little bit harder, as I sensed it may be now or never if autumn 2018 was going to deliver something special. After spending many years as a solitary rare bird hunter, it's been nice over the past 10 or so years to have shared some genuine 'joint finds' with four different friends (two of them called Paul Cook, funnily enough!). Although Jamie and Lee Amery had now left St Agnes either side of some more bad weather coming in from the west, on 17 October Laurence and I went birding together to try to prop up each other's spirits as the clock began to wind down. It was a tactical decision to spend the last two hours of daylight in the more densely vegetated lanes of my employer's land in Covean. We'd scoured all of the obvious areas and if we had to adopt some sit-and-wait tactics, I figured this would be the most likely environment in which to do it. Laurence was slightly ahead of me when a bird flew down the edge of a field straight towards us and then dropped into cover. Something in our respective subconscious minds perked up our intensity another notch. Having both seen hundreds of Dunnocks, European Robins and Blackcaps do such a thing over the past several weeks, something seemed different about this latest blur of feathers. I took half a dozen steps to my right and, to my everlasting joy, rather than having dropped straight into the dense Pittosporum, the bird had flown through the hedge and landed momentarily on the footpath right there in front of me. In one wholesome, unforgettable moment, it was an obvious Grey-cheeked Thrush in an iconic, hunched pose, looking up, with its heavily spotted upper breast cut off sharply against its remaining dirty white underparts. In an instant it was gone, but moments later it did a low fly-past, so close if I had dived like a goalkeeper I would certainly have caught it. It moved so quickly, Laurence hadn't even had time to get his bins on it by the time I rushed off to find a phone signal to put the news out. It wasn't seen again that evening, but that was no hindrance to my friend and I retiring ecstatically to the Turk's Head, the only two birders present while the locals conducted their weekly quiz night. Both of us had found Grey-cheeked Thrush on St Agnes before, but certainly in my case, it had been something of an accidental find when I'd been out working. Indeed, all of the half-dozen American passerines I'd come across in the UK previously had been 'out-the-corner-of-my-eye' experiences when I had been least expecting them. It had become something of a baffling mystery how I never seemed to come across one when I was in the mood, or the zone, actively seeking them. For that reason, in particular, this Grey-cheeked Thrush find was a personal high and to have found it in exact conjunction with one of my dearest friends meant I was mostly conducting conversation through tear-moistened eyes all evening. It had been, as Vinnie Jones said in Lock, Stock and two Smoking Barrels, emotional! But that was not the end of the Grey-cheeked Thrush story. Next day I was one of only a small handful of people to see it; none of the two boatloads of St Mary's birders, cramped into a tight viewing arena, being able to get on it during its short dashes from one dense patch of cover to another. It remained extremely hard to see well for the following four days. Laurence eventually had to leave the island with only a combined total of 20 seconds' viewing and only once managing to get his binoculars on the bird to fully appreciate it. Little by little this mercurial, almost other-worldly creature revealed itself more regularly to visiting birders – eventually establishing a pattern of occurrence on a footpath enclosed by tall sycamore trees and dense Pittosporum soon after sunset. The Grey-cheeked Thrush, photographed when it relocated to St Mary's (Kris Webb). A few days later I left St Agnes to stay on St Mary's for another fortnight. I was reasonably satisfied with my views of the thrush and glad of some hastily taken photographs posted by Steve Rowe and Steve Williams. My hopes of it appearing on the adjacent seaweed-covered, insect-rich Covean Beach had not been fulfilled. Then, one morning, as I stepped out of the shower, a message came through from Spider: "Just found a Grey-cheeked Thrush on Porthcressa Beach, feeding on the seaweed." Being nearly two miles from the original Grey-cheeked Thrush, feeding out in the open, and showing shades of brown rather than olive-grey on the upperparts, it had to be a different bird, didn't it? Apparently not. Later that day when I had a chance to compare my notes on the current bird to the best photos from St Agnes, it was quite apparent it was the same individual due to some matching feather detail that was beyond coincidental. Northerly winds set in for the last 10 days of October right across Britain, no doubt eliciting a series of groans from birders up and down the country who'd had little to cheer apart from the catbird. At any other time of year in such conditions you could have expected to find me indoors. Yet it has become apparent in the third and fourth weeks of the month that the south-west of England – Scilly in particular – often becomes a repository for many migrants edging their way further south. The winds were mainly light and occasionally veered slightly to the north-east, and in a short period of time brought us a Rustic Bunting, several Rosy Starlings, a couple of Dusky Warblers, a few European Serins, one or two Red-throated Pipits and a wonderful Long-eared Owl that was my bird of choice to watch for a couple of hours on the afternoon I returned from a rather poor day trip to St Agnes. A Red-eyed Vireo appeared on Bryher too; either being a product of the Atlantic fronts mid-month, or perhaps one of those 'trickle downs' that can offer us vague hope later in autumn following arrival weather to the north of us weeks earlier. My second favourite moment of October 2018 underlined my burgeoning interest in insect recording. I've glossed over the Silver-striped Hawkmoth and Wedgeling Moth (the latter a third for Britain) that I saw in Dave Grundy's living room at Troytown (plus the Death's Head Hawkmoth caterpillar I inherited to babysit for the winter), but here's one insect-related tale I thought worthy of a small diversion. I'd just spent a lovely sunny morning seeing the above-mentioned Rustic Bunting and Dusky Warbler in the Longstone/Lower Moors triangle, and had settled down to have lunch on Porthcressa Beach with my first Scilly Great Egret (albeit no more than a distant backlit silhouette at the edge of the ocean). Finishing my sandwich, I thought a little afternoon nap on the sand might be in order, so I took off my socks and shoes, and settled down to visit the land of nod. I'd just fleetingly crossed the threshold when I heard my name being called from above. I sat up to find Charles Hughes standing on the boardwalk and pointing in the direction of my first-ever Vagrant Emperor, a metre above my head. October drew to a close with an outstanding Olive-backed Pipit in the Dump Clump allotments; a couple more European Serins, a Common Rosefinch at Rosenhill and a succession of Rosy Starlings that I kept missing by minutes. For the last three days of the month I returned to St Agnes on the strength of a forecast south-easterly wind with rain. Somewhat in keeping with the theme of near-misses earlier in the month, the rain clouds ended up stalling until midday and virtually nothing new came in ... at least where I was looking. I hadn't been back on St Agnes that long when Spider phoned to tell me he'd just picked up a Blyth's Pipit on St Mary's. This was something I really wanted to see – having only ever seen one anywhere previously – but I wasn't yet ready to abandon my post altogether. Unbeknown to me, however, both the St Mary's and St Agnes Boating Associations had switched to their winter schedules and I found myself unhappily stranded on a dark, cold, gloomy and birdless St Agnes for a further 48 hours. The last day of October dawned sunny and calm and I braced myself for news of the pipit's departure. Thankfully, I got a call at 9 am telling me it was still present and a boat at 10 am saw me hot on the trail. I picked up my only Little Bunting of the autumn as I dashed down to St Agnes Quay, but didn't have time to grill it for more than 30seconds before I was off. On St Mary's I gave myself five minutes with the gorgeous and obliging Olive-backed Pipit on the way to the Blyth's in the middle of the island, then I cycled off. And there it was: secreted away in a private field which a small number of us obtained access to. The St Mary's Blyth's Pipit was Graham's second (Kris Webb). The only previous Blyth's Pipit I'd seen (a few years earlier on Peninnis Head) had been the fulfilment of half a lifetime's worth of wondering if I'd ever see one, but it had performed at some distance. In this current intimate setting, I was occasionally left on my own to view at close range this former enigmatic species that had taxed the ingenuity of birders growing up in the '80s and '90s. The change of status of Blyth's Pipit has not been as dramatic as, say, Olive-backed Pipit, yet this bird was now the seventh for Scilly and I was perhaps one of the few left for whom this was still a hugely exciting moment. Several times over the course of two hours I heard the bird give its diagnostic call as it flew to different corners of the field, and once I saw it perching up for a few minutes half-way up a small isolated elm. That, I thought, was the end of the story for the year. However, in mid-December I was sheltering in the house from a strong gale when local farmer Mike Hicks knocked on my door and asked if I'd seen 'the wheatear'. I've been looking for Desert Wheatear (as a find tick) for many years, but there comes a time in mid-November on Scilly when the law of diminishing returns says it's time to pack up serious birding and return to normal life. I could have been kicking myself for not having come across this startling bird just 200 m from my door, but you eventually learn that it doesn't matter who finds these things: it's just great to see them; and I rushed out the door, full of excitement. 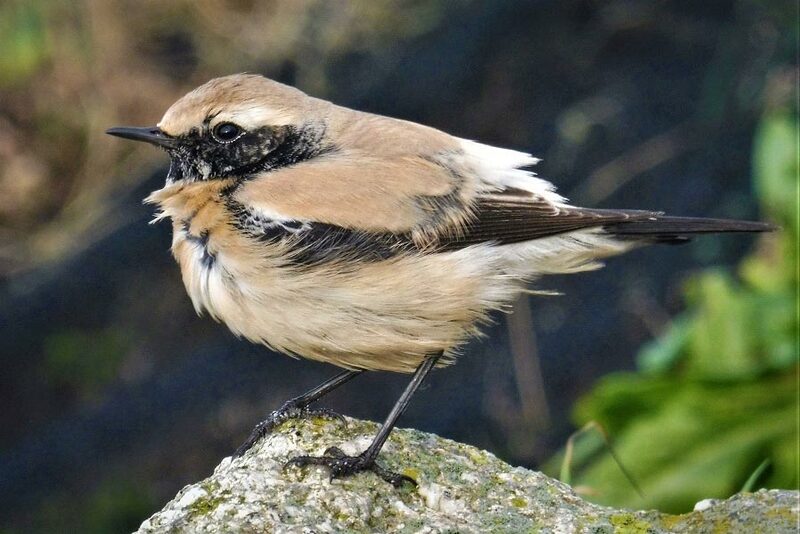 The Desert Wheatear on St Agnes (Graham Gordon). Boxing Day 2018 was especially beautiful and calm, so despite having to work extensively throughout the festive period I got to spend a good few hours with this dapper little bird on the same, iconic, seaweed-strewn Periglis Beach that has provided me with a number of special moments throughout my 11 years here. Unfortunately, I'd become a bit lax about carrying my mobile phone around every time I left the house and, because of that, I missed the American Royal Tern that had been present on St Mary's for several hours, further proof that you don't take your eye off the ball at any time of the year on Scilly! So, there you have it: another year full of exciting bird moments on the Fortunate Isles of south-western Britain. A passing shower on an otherwise sunny New Year's Eve allowed me to finish the year with a Desert Wheatear sat beneath a rainbow – though my camera wouldn't allow me to do justice to the moment, hopefully these words will bring the image to mind in future years! Who knows what 2019 will have to offer? As my employer approaches retirement, it is looking likely this could be my last year as a semi-permanent resident of St Agnes ... will my relationship with the place end with a bang or a whimper?